The algorithm used for calculating these properties is based on a venerable paper by Crippen & Wildman (1999), which has the advantage of being fully described in the literature, and quite straightforward to implement, given the availability of suitable tools – in this case, the ability to carry out SMARTS matches. This is an extension of ongoing work on the cheminformatics back-end, which most recently began providing scaffold substructure matching functionality for the SAR Table app. The low level algorithms now work with a variety of query extensions for specifying exactly how substructures can and cannot match. The atom/bond query annotations are a superset of the SMARTS capabilities, and a hybrid-SMARTS import routine makes it straightforward to specify the lookup queries required to calculate log P and molar refractivity. It is unfortunately quite difficult to find good validation data for property calculations, since journal requirements for backing up claims with data are a relatively recent intervention. Nonetheless, the algorithm is quite amenable to manual verification, which is a good starting point for a sanity check. Running the calculation on a collection of just under 3000 experimental measurements (from an NIH collection from August, 2006) gave an average deviation from experiment of about 0.5 log units, which is about what might be expected for this method. 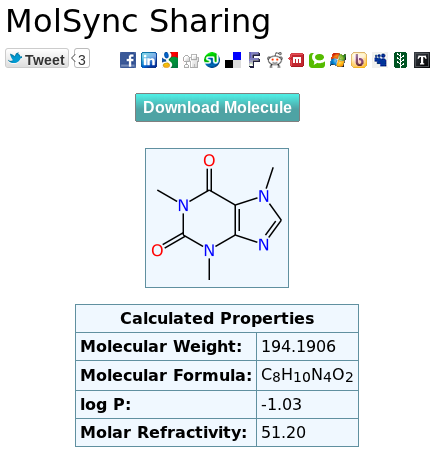 Currently the calculation can be accessed from the web interface, which means that molecules submitted using the MolSync app/Dropbox public folder are subject to the additional calculation. The objective, though, is to integrate this feature into mobile apps, which will happen soon: stay tuned!